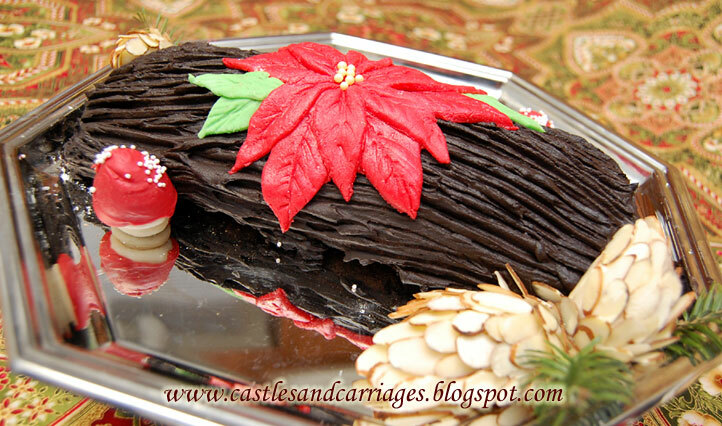 A Buche de Noel or Yule log is served near Christmas (as Noel refers to the birth of Christ). Like the Christmas holiday, the Buche de Noel also has pagan roots. The Yule Log sprang from the ancient Celtic tradition of celebrating the Winter Solstice by burning a large tree trunk to celebrate the rebirth of the sun. Gradually this tradition changed to where families would light the log together and pray to God. While children said their prayers in another room, parents would hide gifts of nuts, dried fruit and coins underneath the log. Eventually as hearths turned into stoves, branches were used instead of logs. 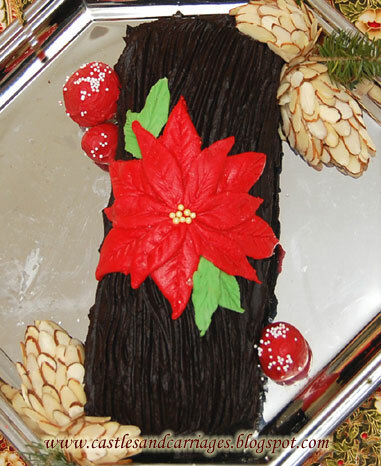 Then the Buche de Noel was created to replace the branches. There are no leavening agents in this recipe. If you would like your cake to rise properly you'll have to make sure you beat in enough air into the egg yolks and egg whites. Otherwise you'll end up with something that looks like a chocolate omelette :( If you don't have a jelly roll pan, just use a cookie sheet that has ridges (to prevent the batter from flowing off). 1. Preheat oven to 375 degrees F (190 degrees C). Line a 10x15 inch jellyroll pan with parchment paper and spray with non-stick spray. In a large bowl, whip cream, 1/2 cup confectioners' sugar, 1/2 cup cocoa, and 1 teaspoon vanilla until thick and stiff. Refrigerate. 2. In a large bowl, use an electric mixer to beat egg yolks with 1/2 cup sugar until thick and pale (about 5 minutes on medium speed). Blend in 1/3 cup cocoa, 1 1/2 teaspoons vanilla, and salt. In large glass bowl, using clean beaters, whip egg whites to soft peaks. Gradually add 1/4 cup sugar, and beat until whites form stiff peaks. Immediately fold the yolk mixture into the whites. Spread the batter evenly into the prepared pan. 4. 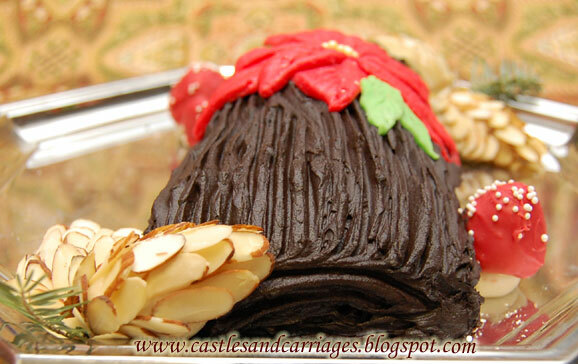 Unroll the cake, and spread the filling to within 1 inch of the edge. Roll the cake up with the about half of the filling inside. Place seam side down onto a serving plate and frost with the remaining half of the frosting. Use a fork to make a bark-like texture on the surface. Refrigerate until serving. Dust with confectioners' sugar before serving. Every detail is perfect! I LOVE all your special touches...the poinsettia, the pine cones! Beautiful cake. Merry Christmas!!! Thank you! This is my first Buche de Noel cake. Merry Christmas to you too Lizzy! Nice job on this! I've never made a Buche de Noel but I admire them very much. Thanks for visiting and leaving a comment on The Big Green Bowl. So nice to meet you! Lovely blog here. Absolutely beautiful! Thanks for stopping by to say Hi.